Instructions: Cut a piece of white cardstock to 9 x 6" size, score and fold at 4 1/2". 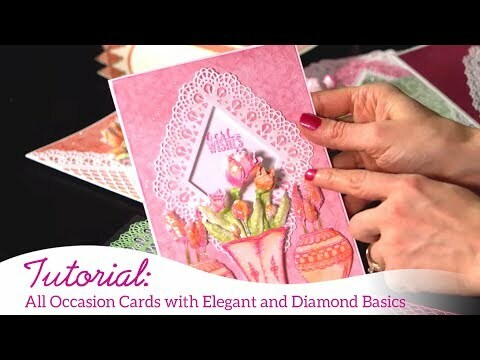 Place the HCD1-7229 Diamonds & Lace Die onto the center front flap of card. Send most of die through die cutting machine, except for a narrow section next to the fold line of card base. This will leave the diecut piece attached to the card base instead of removing it entirely. Next, cut the edge panel strip from paper collection to 4 1/2 x 6" size. Cut a border strip from paper collection. Sponge edges of panel and border strip with Magenta Hue ink. Layer panel onto edge of card and use dimensional adhesive to attach strip on top. Also lightly sponge randomly over diamond diecut and along the outside edge with the same ink. Cut a coordinating piece of paper to fit inside of card. Sponge edges of paper panel with the same ink again and attach to inside of card. Stamp the pansy bouquet from HCPC-3863 Burst of Spring, small pansy x2 and medium pansy x1 from HCPC-3862 Cheery Pansy Cling Stamp Set in Magenta Hue ink onto white cardstock and diecut with coordinating dies. Stamp the small leaf 3x from 3862 Cheery Pansy Cling Stamp Set in Emerald Green ink onto white cardstock and diecut with coordinating die. Stamp the pansy teacup from HCPC-3863 Burst of Spring Cling Stamp Set in Garden Patina ink onto white cardstock and diecut with coordinating die. Use the Stack and Store daubers to color the images. Sponge the innermost part of pansy petals with Buttercup ink, then next to it a shade of Magenta Hue, Cactus Flower, and lastly add a soft touch of Majestic Violet along the edges. For the pansies in the bouquet, use only the Magenta Hue and Cactus Flower inks. For all the leaves, use a touch of Sunflower on a part of petal, then add Vivid Chartreuse over entire petal and lastly a touch of the Emerald Green on the centers. For the pansy teacup, use Garden Patina on the edges and a soft touch of Buttercup on the inside. Use the stylus from the HCST1-401 Deluxe Flower shaping kit to shape the pansy teacup and bouquet. Adhere the bouquet onto the pansy teacup. Place the pansy petals and leaves into the HCFB1-473 3D Pansy Shaping Mold, lightly mist with water and send through die cutting machine. Dab some Transparent stamp paint onto each one of the pansy petals and leaves, then let dry. Then assemble the petals into pansy form, pierce a hole through the centers and thread the yellow wire stamens through. Use hot glue to attach wire on the backside of each flower. Pierce holes in the centers of petals on pansy bouquet. Then thread the wire through to desired length for each pansy and attach with hot glue. Cut a message from the paper collection, sponge edges with Magenta Hue ink and attach onto card as pictured.